The USS Intrepid aircraft carrier will reopen as a museum on November 8. If you happen to see a Cold War-era submarine in the waters around Manhattan today, have no fear; it's just a reminder that the Intrepid Sea, Air and Space Museum is just about ready to reopen its doors to the public. The Intrepid aircraft carrier, which dramatically left Manhattan in 2006 for repairs, has already returned to its Mid-Manhattan home at Pier 86, as has the retired British Airways Concorde jet. 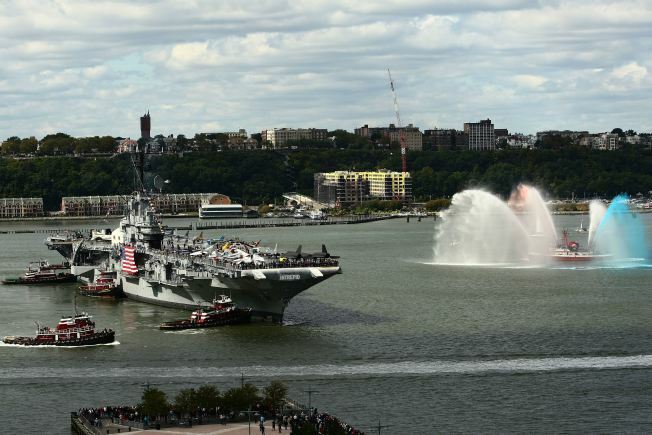 The growler submarine will make its way Thursday from the Brooklyn Navy Yard to its spot on the north side of Pier 86 in the Hudson. The sub will be towed by a tugboat, making a route south in the East River, passing the southern tip of Manhattan and then heading north up the Hudson. If you're desk bound, try to catch a glimpse via one of the NYC Waterways webcams. The Intrepid reopens to the public on November 8, but the Growler is due for interior renovations and will remain closed until Spring, museum officials said.